Wish you all "A Happy and Prosperous Deepavali"
Diwali is one of the most famous and widely celebrated festivals of Indians. It is celebrated on a grand scale by people of all classes and castes all over the country and even in foreign countries also by decorating the homes with lights and by lighting the crackers or enjoying in parties and outings. The name of this festival is actually "Deepavali". It got changed through the tongues of the English people who were ruling over India. Deepavali literally means lines or rows of lights. People used to decorate their homes with oil lights arranged in rows at the entrances. The lights are lit generally in earthen clay bowls with cotton wick submerged in ghee or oil. These lights are placed at the entrances of the house both front side and in the backyard and also at all doors and even windows. It is believed that Goddess Lakshmi enters the houses through the doors that are filled with lights at entrances on this special day of Deepavali and bestows people with wealth and prosperity. Nowadays, oil lights are used very nominally only for continuing the traditional religious practice and mostly electric lights have replaced them with dazzling colors decorated artistically in different beautiful designs and patterns. Moreover, they are arranged in such enchanting and marvelous methods hanging around your building that they twinkle to your eyes with periodic and systematic blinkings and appear to be running or circling all over the building attracting the passersby. Even competitions take place between people to decorate their best and win compliments and praise of the neighbors and public. Deepavali is generally celebrated by most people continuously for five days starting from two days before Diwali and ending after two days. The first day is celebrated as "Dhanteras" on which day it is believed that purchase of gold or silver turns out to be very auspicious for people. So all shopping including a purchase of new clothes, utensils, decorative items, pooja samagri and crackers, etc. is made on this day. Further, homes are washed neatly and the entrance of the house and puja rooms, backyard and even in rooms also rangoli or kolam is made in different attractive designs and patterns to beautify the atmosphere. The next day is celebrated as "Naraka Chaturdashi" which is deemed to be the day on which Lord Krishna killed the demon king Naraka with the help of Satyabhama and brought happiness to people. On this day, we get up early in the morning and take a full, refreshing oil bath with shampoo and soap after applying oil on head and body. Our ancestors used to apply the flour of black gram and green grams all over body after oil and take bath with shikakai in place of soaps and shampoo. Even now, we find shikakai especially used for bathing children as it is a health beneficiary. Then people wear new clothes, pray to God and light some crackers to celebrate the death of Narakasura and spend the day happily. 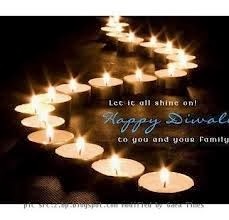 The third day is Deepavali or Diwali. It is a major celebration day. People wear new clothes, perform puja and go to their temples with family and thereafter, enjoy the whole day with special lunch and dinners containing sweets and other special dishes. In the evening time, after lighting the lights, the Lakshmi Puja is performed. Newly purchased gold, silver, and other items are placed before God and worshipped. 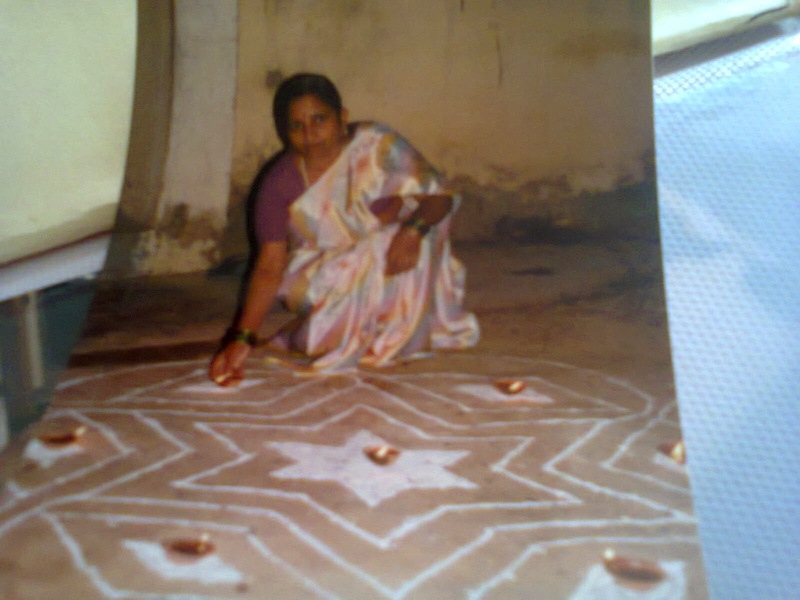 The clay diyas are lighted and placed before Goddess during this period and after showing to Goddess, they are decorated all over the home at the entrances and the backyard and on the rangolis. A diya is placed in the front of the auspicious place of Tulasi also. These clay diyas or lights are very auspicious on this Diwali day. They induce Goddess Lakshmi into your house to bless you and your family with happiness, health, and prosperity. Then the firecrackers are lighted by young and old and especially children in a very joyous mood to celebrate the occasion. Lighting of crackers and decoration of lights are the two main competitive things mostly concentrated by some people who take it as a prestige issue on this day. Some of them purchase crackers worth thousands of rupees and place the crackers in long rows on the whole lane of their homes and light them up enjoying the non-stop lengthy bursting sounds and lights which may be very frightening for some weak hearted people. After lighting the crackers, the Telugu origin children enjoy one more playful event of singing a traditional song in a unique way. A cloth immersed in oil is tied to the Gongura katta (kenaf or roselle bunch) and gets lighted. Then they beat that on the plain earth outside the house for three times singing these verses musically. Bulusu chettu paini peddalaara digirandi"
The fourth day, the day after Diwali is celebrated as Govardhan Puja. It is believed that Lord Krishna lifted the enormous mountain Govardhana on this day to give protection to people and cattle from the anger of Rain God who was prompted by Indra to devastate them as they were not offering prayers to Indra and instead chose to worship Lord Krishna. So people on this day pray to Lord Krishna and the mountain Govardhan in the shape of rice as saviors of their life. They also worship cattle as the means of pleasing Lord since Lord Krishna gets very pleased with this cattle worship and bestows them with all pleasures and protection. The fifth day is celebrated as the Bhai Dooj or Bhaiya Dooj. Bhaiya Dooj means "Brothers day". As it falls on the second day after Deepavali, it is called Dooj or Duj which means the second day of a month. The month changes after Diwali day. It is believed that Yami, the daughter of Sun God, prayed for the welfare of her brother Yama Dharmaraja by tying a sacred thread to his wrist on this day. So, it became a custom for all daughters to pray for the wellbeing of their brothers on this particular day every year. On this Bhai Duj day, the brothers go to their sisters' house and dine with them and offer gifts. This is a way of sharing happiness and at the same time taking the news of her wellness and problems, if any to set them right.